The New York Times writes: For a country that has never won a gold during the winter Games and is fielding only two athletes, the fashion statement made by the team was disproportionately bold. 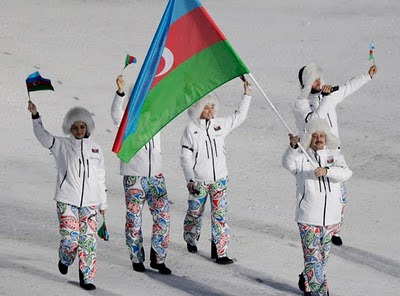 When the tiny entourage emerged, led by Fuad Guliyev, the party of five sported paisley pants — a print no doubt making its Olympic debut — in, blue, red and green, which mirrored the national flag — a nice, if not particularly subtle touch. It makes one wonder what thrilling, trippy theater an Azerbaijani opening ceremony might be if the country were ever to host the Games.